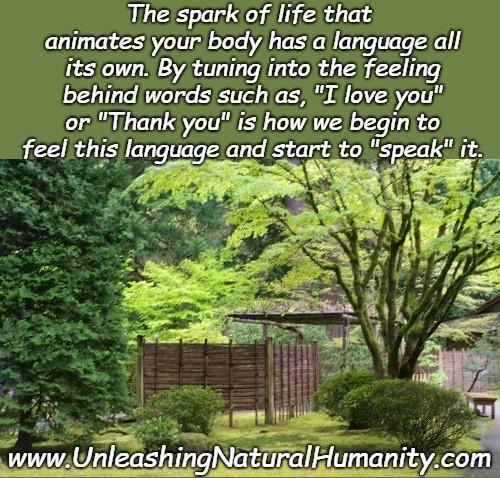 The spark of life that animates your body has a language all its own. 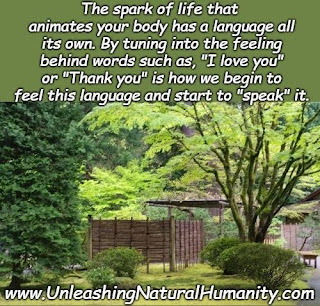 By tuning into the feeling behind words as as, "I love you" or "Thank you" is how we begin to feel this language and start to "speak" it. The body and the Universe at large speak a Language of dynamic flow, sensation, awareness, intention and emotion that have nothing to do with spoken word. This feels like sensations of tingling movement or goosebumps in the body as the iron and water in the blood electromagnetically conduct the activated bioelectricity. This feeling, you can move with your intention and focus, say, into injuries or poorly circulating muscles causing pain. More blood means more stem cells, platelet rich plasma, oxygen and nutrients, which means you heal faster. Once you can feel this activation, put a smile on your face, reverse engineering the smile back into the body as you pull the feeling into the tingling and move it. These are basic Body/Brain Language commands, which is the basis of flow the Universe speaks. Do not ask the body, or hope at the body, or wish at the body to feel better. Activate your internal focus, drop the story of words and heal yourself by creating what you want to experience in the body. This knowing can translate to OUTSIDE the body as well, gaining the foundation to truly build extrasensory perception and various psychic abilities.